Deborah Plummer offers over 100 activities and games specifically aimed at helping children to build emotional resilience. With a mixture of short, snappy activities and longer guided visualizations, these exercises are suitable for use with individuals or groups, and many are appropriate for use with children with complex needs or speech and language difficulties. 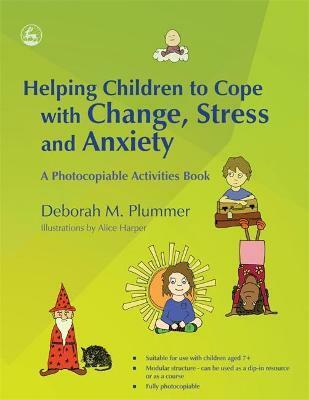 This unique photocopiable activity book will be an invaluable resource for parents, carers, teachers, therapists and anyone looking for creative, enjoyable ways of helping children to cope with change, stress and anxiety. It is primarily designed for use with individuals and groups of children aged 7-11, but the ideas can easily be adapted for both older and younger children and children with learning difficulties. Acknowledgements. Preface. Part 1. Being There: Interacting Mindfully. 1. Supporting Emotional Well-being. 2. Understanding Why We Do the Things We Do. 3. Encouraging Imaginative Solutions. Part 2. Skills for Life. 4. Self-awareness. 5. Imagework. 6. Feelings. Part 3. Coping with Change. 7. Thinking About Change. 8. Preparing for Change. 9. Making a Change. Part 4. Coping with Stress. 10. What is Stress? 11. Changing How We Feel. Part 5. Coping with Anxiety. 12. Thinking, Feeling, Doing. 13. What We Do with Worries. Part 6. Moving On. 14. Setting Goals and Celebrating. Index. Activities Index. is perfect for schools and teachers working with kids ages 7 and older. It offers a fully photocopiable set of activities, and combines theory with games and activities designed to help kids manage their emotions. A fine pick for any teacher's collection. -- The Bookwatch This book is full of creative ideas for use with children who have difficulty in coping with change, stress and normal levels of anxiety...This unique photocopiable activity book will be an invaluable resource for parents, carers, teachers, therapists and anyone looking for creative, enjoyable ways of helping children to cope with change, stress and anxiety. -- SMIRA (Selective Mutism Information and Research Association) The exercises encourage children to link behaviours with anxiety and stress, and promote the idea of a toolbox of activities to minimise them. The book is intended for seven to 11 year olds but could be expanded to a wider age range. It would be a valuable resource for SLTs who manage emotionally-distressed children with language and social communication disorders, particularly those working in child and adolescent mental health services. -- Bulletin of the Royal College of Speech and Language Therapists This book is an excellent blend of practical activities to help promote emotional health, and accessible theory to help practitioners to understand why we behave as we do, and what can be done to help children develop positive choices and emotional security... This is a most helpful and well organized for anyone involved in the holistic development of children. It is well written, clear and jargon free, with a good balance of theoretical explanation and practical activities. It has a useful list of story books (although by no means exhaustive) for use in these contexts, an index and an activities index. -- School Librarian Journal This book is a most valuable resource for the parent, the primary teacher, the nursery nurse or indeed, for any adult who is concerned with helping children to cope with the difficulties and challenges involved in a child's emotional development... In practice, the handbook inspires an abundance of creative and imaginal experiences and exercises to enable children to develop creativity, self-awareness and to raise self-esteem. The photocopiable resources are attractive and stimulating and designed to promote problem-solving, to develop resilience, and to begin to understand and self-regulate difficult feelings. The approach aims also to develop the child's emotional literacy, allowing the child to name and understand emotions that otherwise might have the capacity to overwhelm them. -- BACP, Counselling Children and Young People Deborah Plummer provides a refreshingly light, accessible text that addresses a serious issue. Packed with activities aimed at helping children to understand and manage their emotions, the target readership is primarily teachers, social workers, carers and parents. However, the book provides a useful resource for anyone seeking creative ways to help children deal with stress, anxiety and change. The photocopiable activities and suggested discussion points are pitched at children aged seven to 11, but they lend themselves to adaptation for both older and younger children. They are also adaptable if necessary, to meet the specific needs of children with communication and learning difficulties, and those who do not have English as their first language... The book's main strengths are two-fold: accessibility and versatility. It can be used as a resource to "dip into", with each part of the book being sufficiently discrete to facilitate this. Alternatively, it can be used as the basis for a "course" on coping with stress, anxiety and change. Versatility also means that the activities can be used with individual or groups of children. Irrespective of the mode of use, readers are at liberty to choose the most appropriate salient parts of the book to meet their needs. Overall, Plummer claims to have provided a resource with practical activities and strategies to help children cope with change, stress and anxiety. -- Wiley Online Library This book is especially helpful for children with age appropriate language levels and an ability to use images and imagination to develop an understanding of their own emotions. Many of the exercises can also be adapted for use with children with complex needs or speech and language difficulties. Deborah M. Plummer is a registered speech and language therapist and imagework practitioner with over 20 years' experience of facilitating groups and working individually with both children and adults. Formerly a clinical lead therapist working within the NHS, she now lectures at De Montfort University, Leicester and runs workshops and short courses on the uses of imagery and issues of self-esteem. Deborah is author of several titles, including Helping Children to Build Self-Esteem - A Photocopiable Activities Book, Self-Esteem Games for Children, Social Skills Games for Children, Helping Adolescents and Adults to Build Self-Esteem - A Photocopiable Resource Book and Anger Management Games for Children. Deborah's website can be found at www.deborahplummer.co.uk.